Posted by Eddie & filed under Mountains & hills, Science, July 9 2010. For the past few years I’ve made summer trips to the Cairn Gorm – Ben Macdui plateau in the summer months to check on the snowpatches that remain at high altitudes on the plateau (see the previous blog postings ‘Summer snowfields in the Cairngorms (2)‘, from August 2009 and ‘Summer snowfields in the Cairngorms‘ from July 2008). 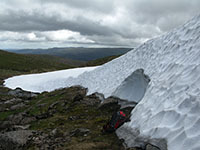 See my website page here for more information about ‘perennial’ snow in the Scottish mountains. Last Saturday I made another trip to the Cairngorms for a walk to have a look at these snowpatch areas. I was particularly interested to see how the large snowfalls and low temperatures of the recent winter in the UK have affected the summer snowpatches this year. Perhaps surprisingly (and possibly counter-intuitively), the snowpatches that remain on the Cairn Gorm – Ben Macdui plateau this year are almost identical to those that remained on my last July visit, in 2008. From what I saw during my walk on Saturday, it appears that the severe winter has not contributed in any special way to increasing the size and number of the remaining summer snowpatches. Patches near the Fèith Buidhe river, in Coire Domhain and along the Garbh Uisge Beag and Garbh Uisge Mòr rivers towards the summit of Ben Macdui were, if anything, slightly smaller than they were in 2008. It seems that the winter this year was very unusual, in that the snow that fell on the UK came on northerly and north-easterly prevailing winds, which are not conducive to filling the north and east-facing corries in the Scottish mountains, and hence these corries (which are the locations in the Scottish mountains that best retain snow late into the year) were not filled with any extra depth of snow this year. There has also been some strong periods of thawing in the spring months this year, which have radically depleted the huge snow cover on the plateau that I saw on a walk only 14 weeks previously to this visit (see the blog posting ‘Cairn Gorm winter walk’). This was also despite the cold conditions I encountered in the Cairngorms in early May, see the blog posting ‘ML refresher course’). The snowpatch at Ciste Mhearad near the summit of Cairngorm was about as large as it was in July 2008, although there was an impressive depth of snow on its south-eastern ridge (over 2m), which also contained large scalloped indentations which I assume are the remains of snowholes from winter skills courses. I walked over to the western edge of the plateau, where the March Burn plunges down to the Lairig Ghru. I had wondered if the unusual winter conditions had left a snowpatch in this area, and sure enough, there was a patch, one which I had never encountered before. The burn had melted a tunnel through the patch which I crawled into, which was very impressive and gave me a good view of the hard and icy interior of the snowpatch. It was also possible to see the layers of snow that had built up the snowpack over succesive snowfalls in winter storms. The interior of the snowpatch was noticeably colder than outside and reminded me a lot (albeit on a smaller scale) of the Snøhetta glacier that I visited in Norway in 2003 , which also had a tunnel carved by a stream at its tongue (see photograph on my website here). I descended off the plateau via the Goat Track into Coire an t-Sneachda, which still contained several large patches of snow, perhaps unusually so for June. You can see the photos from the walk on Saturday on my website here. 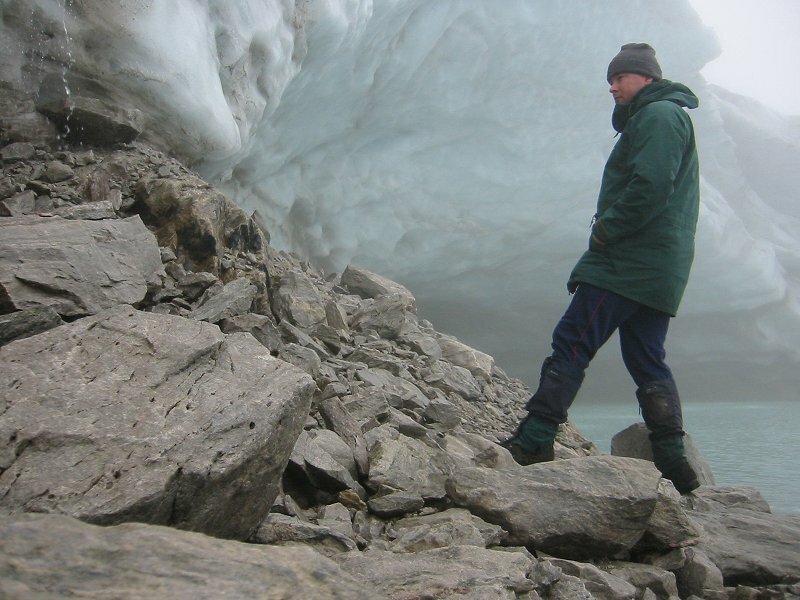 The latest findings and collected data on snowpatch survival in the Scottish mountains are published annually in a paper in the Weather journal of the Royal Meteorological Society. This year’s paper can be seen here (accessible from subscribed institutions only), and contains an acknowledgement to me for some information I supplied about the survival of a snowpatch on Ben More near Crianlarich in 2009.